Bihar finds mention in the Vedas, Puranas, Epics etc and was the main scene of activities of the Buddha and the 24 Jain Tirthankaras. The hermitages of ancient monastic orders cluster in the plains and hill sides. The teachings of Buddha and Mahavira, deeply engraved in the enduring ruins and relics ring down the corridors of time. Religion is ever present in the daily life of the people. Besides prominent ones like Hinduism, Buddhism and Jainism, other religions like Islam, Christianity, Sikhism etc are also found here. The Hindus are the largest religious community in Bihar. Hindu piety involves rituals and ceremonies, celebrating festivals, making pilgrimages, building temples, reading the Ramayana and chanting the Gayatri Mantra. 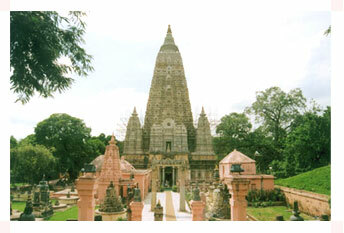 There are a huge number of temples in Bihar. The Hinduism of the masses is chiefly characterized by polytheism which has given rise to many cults such as Shakta, Shaivism, Vaishnavism etc. Each cult and sect has its own special gods or goddesses, but all combine to revere other deities of the Hindu pantheon and join in their worship. The working religion of the peasant's everyday life consists of the propitiation of his 'Ishta Devata' (favourite deity), ghosts (bhuts) and spirits (prets), in order that they may not afflict their worshippers or may grant them material blessings. The primitive propitiation of evil spirits and god lings and the worship of the Hindu gods go on side by side and quite often the same men make offerings to both. Besides Brahma, Vishnu, Shiva and Durga, one of the most important local deity is the elephant headed god, Ganesha. Ritualistic greeting of the rising sun and the ceremonial morning and the evening ablutions are widely observed by all devout Brahmins. Hindus believe in karma, image worship, rebirth and fatalism. Worship in the temples is done by Brahmin priests. He recites the mantras and makes the offerings for the worshipper. The priests have a considerable hold over the people especially in the rural areas. Their advice is sought when a difficulty arises, usually by the women. There are countless grotesque and degrading superstitions in which so many of the peasants and labourers still seek priesthood. The priests hope by these means to retain their hold on masses and even the more educated and liberal minded among them do little actively to combat such beliefs. Hinduism in Bihar is a religion of caste rules and usages. Its sanctions are ultimately social, its laws immemorial group customs and its tribunal the committee of the fraternity, it presents itself to the ordinary man not as a statement of the eternal principles of morality, but as a formidable code of etiquette ruling the details of his personal life. He finds himself greatly concerned that he should not marry a woman not belonging to his caste or dine with a man not of his own community, he should not help the wrong man or entertain vague caste prejudices against the right one. Bihar is known for its factionalism, while others think of themselves as Bengalis or Punjabis, Parsis or Muslims, in Bihar their compatriots think of themselves only as Bhumihars, Rajputs, Kayasthas or Maithil Brahmins. Hinduism offers them the hope of salvation from the hard life they lead.